Low weight ensures the drill is easy to use and it reduces user fatigue. Compact design enables comfortable use and allows access to tight spaces. 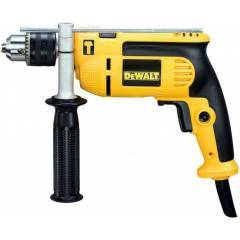 An excellent power to size ratio results in a powerful, durable drill in a compact size. Rubber back handle increase comfort to the user in drilling and hammer drilling applications. Trigger sensitive variable speed switch allows a user to drill slowly for precision accuracy when starting to drill a hole. Lock on button gives the user the option to keep the machine continually running when doing repetitive operations. Drilling in concrete, masonary, steel, wood & Fixings. 1 Main unit with Chuck key, Multi-position side handle & Depth stop. Homeowners must have this to do repair jobs.